Unlike most neighborhoods, Woodruff Place is responsible for maintaining considerable infrastructure, none of which is funded any longer by the City of Indianapolis. 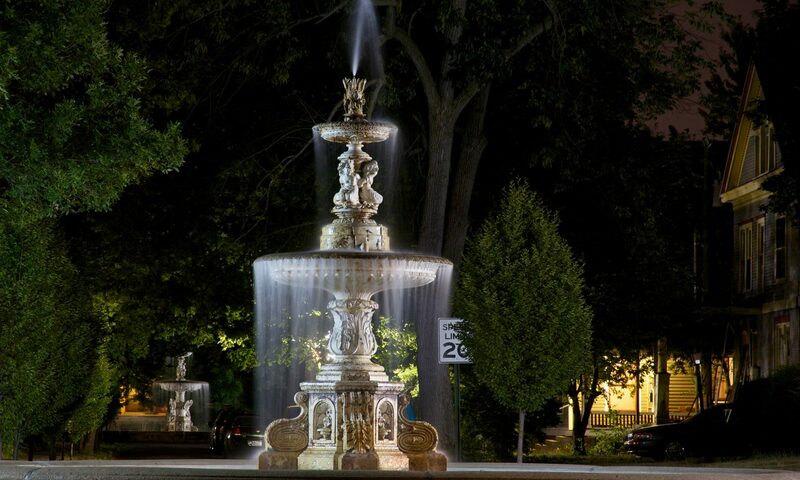 This includes our Town Hall, the Tenth Street fence, streetlights, fountains, esplanades, statuary, urns, and trees. Over the years, as the Indianapolis city budget has been reduced, the city has cut services to Woodruff’s entire infrastructure. The city has implied that further cuts could be on the way. Our neighborhood volunteers conduct several successful fund raising activities, yet these efforts barely keep pace with our infrastructure needs. Without a regular source of income, Woodruff Place will be unable to repair and maintain what we have, let alone plan for future needs. What is an Economic Improvement District (EID)? An EID is a financing mechanism for a defined district, used to provide revenue for a variety of local improvements and services that enhance, not replace, existing municipal services. An EID is self-imposed and self-governed and must be supported by property owners in the defined area. I already pay taxes! Why support an EID? Local taxes, of course, are used for priorities throughout the City, not just in Woodruff Place. Legally, funds raised by an EID must be used in the same area that is being assessed – in this case, WPEID funds can be used only for improvements and services that benefit the defined Woodruff Place EID. WPEID budget and assessment rates are set by a Board whose members are Woodruff property owners, ensuring a high degree of accountability. What do WPEID funds pay for? A Management Plan has been developed to guide WPEID services. Based on input from many property owners, the WPEID budget will focus only on maintenance and major life-extending projects for Woodruff’s historic infrastructure. Who will manage WPEID programs? to maximize accountability, the WPEID Management Plan provides for a WPEID Board of five to seven members, all of whom must own property in Woodruff Place, with a mix of single family and rental property owners represented. Policies, budgets, assessment rates, and project management will be implemented by the WPEID Board. The WPEID Board can seek additional funding from other sources (Foundations, etc.) and will work closely with the Woodruff Place Civic League and Historic Woodruff Place Foundation. Will the City reduce existing services in Woodruff Place? The WPEID will not replace any services the City provides, currently, such as street repair and cleaning, curb and sidewalk repair, garbage pickup, etc. However, the City has severely reduced and/or eliminated funding for Woodruff’s historic infrastructure over the past two decades. Its preservation falls to the neighborhood. How is the EID formed? By Indiana statute, the formation of an EID in Woodruff Place requires the submission of petitions to the City-County Council that support the district signed by 1) a majority of owners of real property within the Woodruff Place, and 2) owners which constitute a majority of the assessed valuation in Woodruff Place. the City County Council schedules a public hearing, then acts on an ordinance forming the WPEID. Annually thereafter, the WPEID Board submits to the City Council its budget, assessment rates, Board roster, and plan for the coming year for review and approval. How much are the assessments? How are they collected? Initial proposed assessment rates – set annually by the WPEID Board and approved by the City-County Council – will generate about $45,000/year. Assessments appear as a line item on property tax bills, and non-payment has the same consequences as not paying property taxes. The proposed rate is uniform for one- to three-family properties (about $.45/day), higher assessments for commercial properties: 4-19 units ($.67/day), 20-39 units ($1.35/day), vacant lots $.11/day), other residential $.22/day). Will my WPEID assessment increase? Assessment rates may be adjusted or left the same annually by the WPEID Board (whose members are Woodruff property owners), using the process of notification, public hearing, and submission to – then review and approval by – the City-County Council. Will the WPEID last forever? No. The WPEID has a proposed fifteen-year term, with a detailed review every five years. If Woodruff property owners want to continue beyond fifteen years, they will have to repeat the petition process. The WPEID can also be dissolved prior to the expiration of the fifteen year term. Are there examples of other EIDs in the Midwest? Several EIDs exist throughout Indiana and the Midwest in places such as Fort Wayne; St. Louis, Missouri; Lincoln, Nebraska; Milwaukee, Wisconsin; and Kansas City, Missouri.